Get ready for an incredible fishing experience in Alaska's Last Frontier. Few places on earth compare with the wonders of Southwest Alaska. The area is home to more than 240 bird species along with brown bear, caribou, elk, and more, but we're here to talk about the outstanding fishing you can enjoy at lodges across the region. From rustic outfitters delivering a unique experience to the luxury fishing lodges offering fly-in service, you'll find it all here. Start planning your own Southwest Alaska fishing adventure with the help of these exceptional properties. An intrepid fisherman will go to the ends of the earth to catch “the big one”. Practically at the end of the earth (or the US, at least), atop a bluff overlooking the wild and scenic Alagnak River, sits the Alagnak Lodge. Bristol Bay is home to the world’s largest salmon migration, and each summer millions of wild salmon pass through its frigid blue waters. 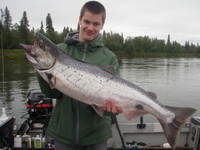 Alagnak Lodge capitalizes on this by offering the best fishing experience in the area. Hop into a boat and motor just a few minutes down the river, where you’ll cast off. There are five different types of salmon in the water with the eponymous King Salmon preferring the deeper water in the middle of the river. Your friendly guides will teach you the tips and tricks necessary to land one for yourself. Upon your return, head over to the supremely comfortable main lodge, where your cozy room will be waiting. Featuring rustic decor and plenty of modern amenities, you’ll never want to leave! Go on an Alaska's Gold Creek Lodge vacation and the only thing you’ll worry about is what kind of fish you should eat for dinner. The friendly and knowledgeable staff will handle all the minutiae of an all-inclusive fishing trip so you can focus on what really matters: catching the big one! As the unofficial gateway to Katmai National Park, Alaska’s Gold Creek Lodge is approximately 280 miles from Anchorage, and nestled snugly within the Bristol Bay watershed. 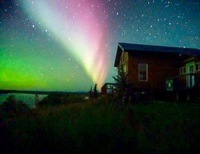 Perched on the banks of the world-famous Naknek River in beautiful King Salmon, an all-inclusive experience begins with first-class accommodations.With only 12 to 14 guests at any one time, you know you’ll be getting their utmost attention. After you settle into your rustic lodgings, hop into a float plane and head out to the southwestern peninsula, only accessible by air. The Naknek River is boasted by Fish Alaska Magazine as “the best rainbow trout fishing in Alaska,” so you know there’s fantastic fishing to be done! Featuring easy access to more than 30 different rivers and streams all teeming with fish, a stay at Alaska Rainbow Lodge is one you'll never forget! As you might guess, the waters around the Alaska Rainbow Lodge are filled to the brim with Trophy Rainbow Trout, but the fish goodness doesn't stop there. Arctic Char, Silver Salmon, King Salmon, Sockeye Salmon, Grayling and more can be found across 3,000 square miles of the Iliamna-Katmai watershed into Bristol Bay. There’s simply no such thing as a bad day of fishing at Alaska Rainbow Lodge. And when you add in the gorgeous quarters you'll be residing in, it's easy to see why guests return to the Rainbow Lodge year after year! Fish the Nushagak River for Trophy King Salmon or fly out to a remote location for kings, silvers, or sockeye salmon on the fly! 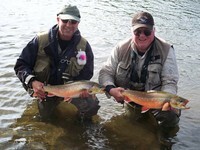 Nushagak River Lodge offers incredible fishing for all, matched only by its superb hospitality and accommodations! Here you'll fish multiple pristine remote Alaska rivers all summer- land a double digit trout, fight a monster king salmon or hook an acrobatic silver salmon. The Lodge's superb location enables them to fish the lower Nushagak River in Bristol Bay where the peak Salmon fishing happens- whether you're an angling rookie or veteran, you'll have an unforgettable time! With over 165,000 King Salmon a year, the Nushagak River is Alaska's Largest King Salmon run! Dillingham, Alaska is located 350 miles southwest of Anchorage. 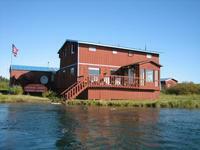 Nushagak River Adventures is one of the few real wood framed lodges on the lower Nushagak River. For an unforgettable Alaska experience that takes into consideration your comfort and your budget, there's no place better than Naknek River Camp. Planning an Alaska fishing adventure doesn't have to be a cause of stress, and it doesn't have to break your bank. Naknek River Camp understands the importance of enjoying a fishing trip that's affordable and memorable. Their ideal location on Naknek River ensures you're close to the action, while their all-inclusive rates provide you with lodging, meals, a boat, and fishing guide. Cast your line in the Naknek River and reel in incredible rainbow trout, arctic char and grayling, and all kinds of salmon! Keep your eyes open for signs of wildlife such as black bear and eagles, and enjoy the sounds of nature as you wait for the fish to bite. Afterward, return to the lodge to indulge in a meal at their dining room and share tales of your exciting adventures. You'll have transportation to and from the airport available. The wild Alagnak River would make for a stunning background for ANY resort, but Alaska Trophy Adventures Lodge isn't just any resort. It's THE resort. Alaska Trophy Adventures Lodge is the ideal wilderness fishing retreat for all skill levels. Step out the front door and you have immediate access to the 160 acres of prime river frontage on property. As ATAL is only accessible by bush plane, you know that the river is crystal clear and unspoiled! Away from the water, you'll love relaxing in any of the Lodge's welcoming wooden cabins. All are equipped with comfortable beds, running water, and heating and power, offering reasonable comforts while maintaining the spotlight on the beautiful outdoors. Grab the fishing pole and get to it today! Arctic Char are a beautiful fish that closely resemble a large brook trout. They are strong fighters with very similar feeding patterns to trout. Rainbow Trout are known for their great size and the great fights they put up! Enchanted Lake Lodge will whisk you away on a magic carpet ride of fun, comfort, and fishing. The friendly staff will make sure of it; don’t worry, you’ve got a friend in them! With 54 acres of privately owned land and spectacular views of Nonvianuk Lake and the Walatka Mountains, Enchanted Lake Lodge invites you to be their guest. They promise that you ain’t never had a friend like them! The lodge is ideally located for quick and easy access to the best streams and rivers of the Alaskan Peninsula, the perfect places for fishing under the sea. Enchanted Lake also claims that its guides are the best in the business, providing passionate, veteran expertise and care for each and every guest. Don’t worry- they’ll make a fisherman out of you! The Lodge was built in 1961 and remodeled from the ground up in 2002. Why is it called "Enchanted Lake"? Because the fishing is so good you'd swear it was magic! As you look out from the dock of Bristol Bay Lodge, you can almost smell the fish jumping. Excitement doesn’t do it justice, what you are. Soon you’ll be out on the water, casting away for salmon, trout, and (hopefully) northern pike. And after, you’ll come back to your exquisitely cared-for room, rest, and do it all again. Life is good. This doesn’t have to be fiction; you can make it your fact by taking a much-needed fishing vacation at Bristol Bay Lodge. Set on the north shore of Lake Iliamna and squarely between Lake Clark and Katmai National Park, Bristol Bay is the perfect place to relax, sightsee, and get a lot of fishing done. Both float planes and tundra-tire bush planes are available at the lodge to fly you out to where the fishing is best. You’ll then hop into a boat and your knowledgeable guide will give you the tips and tricks needed for a successful expedition. And as there are never more than eight guests at the lodge, you know that you’re getting the personal service you deserve. Do you need anymore convincing? Get up to Bristol Bay right now! Professional fly fishermen, congressmen, General Chuck Yeager, and even the President of the United States have all fished at Bristol Bay Lodge. When he wasn’t penning The Old Man and the Sea, Ernest Hemingway was an explorer, going everywhere from the heart of Africa to the untamed splendor of Alaska. Not many people can say that they’ve stayed in a lodge that Hemingway wrote about- come to the Kvichak Lodge and you’ll be one of those select few! Set on the eponymous Kvichak River, the Lodge was built during World War II and has flourished in the years since. Of course, being next to the best fly fishing in Alaska and home to the world's largest sockeye salmon run, how could it not? Fish of all sizes, colors, and species call the area home, from toothy Northern Pike to fat Sockeye Salmon. The dedicated guides will take you out for a full day, then bring you back for a delicious five-star meal. Ingredients are fresh and locally obtained, and the chef will even prepare any salmon you might have caught during the day. Enjoy your spoils at the Kvichak Lodge! Northern Pike reach 15 pounds and measure 35 inches in Alaska Waters. Five-star rustic luxury awaits you at the next Lodge on the list, Rapids Camp Lodge. With a huge staff of nine guides, four pilots, two gourmet chefs and multiple support personnel, the max 20 guests per week always feel cared for and incredibly well prepared for the fishing experience of a lifetime. “Easy to get to, hard to leave” are the words that greet you at Rapids Camp Lodge’s website, and they’re there for a reason. While just an 80-minute flight from Anchorage, the Lodge has unparalleled seclusion and serenity. A fishing trip to Rapids Camp is all-inclusive; they’ll provide the rods, reels, tackle and waders, in addition to various types of boat that will get you from A to B! Hit the river and try your hand at wrangling a monster, be it rainbow trout, salmon, Arctic char, pike, or grayling. Calling over 60 acres of land and over a mile and a half of river frontage home, Rapids Camp Lodge will grab onto your attention and refuse to let go. King Salmon is 284 miles southwest of Anchorage. Plain and simple, the Nushagak River is Alaska’s most prolific river for Alaska King Salmon Fishing. Many resorts have been constructed in the area to take advantage of the incredible fishing, but few even come close to the level of success and quality the Alaska Kingfishers have. Welcoming fisherpeople of all skill levels, a trip to Alaska Kingfishers is a commitment to battle against nature and, with a little grit and determination, come out on top. Fly fishing and conventional tackle guided fishing guides are available, so if you’re a novice with either they’ll be more than happy to lend a hand. Rainbow Trout, Arctic Char, Arctic Grayling, Northern Pike, and Sockeye Salmon are just a few of the fish in the area, but fishing is just a part of the fun. The backdrop is incredibly gorgeous; on a regular fishing day make sure your eyes are peeled for the occasional thirsty moose or majestic bald eagle. If you’re looking for a unique Alaska fishing trip, you have no need to look further. The Nushagak River is 280 miles long. It is estimated that over 50% of the world's production of wild salmon is harvested in the Nushagak River and the Bristol Bay area. Whether you’re a savvy veteran or a wide-eyed newbie, Katmai Lodge can show you the best fishing experience of your life. Surrounded by nature’s best and connecting with it on a nigh-spiritual level has never felt so rewarding! Boasting that it is the ORIGINAL river-based lodge on the famed Alagnak River, Katmai has been doing this longer than anyone. Their longevity is a testament to their commitment to excellence. A fishing stay at the lodge will be filled to the brim with helpful advice from your friendly guide, splendid vistas exclusive to this part of the world, and, of course, top-notch fishing. The river has a multitude of species, from Pacific Salmon to Dolly Varden. Cast off while enjoying the crashing glory of the world famous Brooks Falls, or watch from afar as a family of brown bears wade into the river to intercept the Sockeye salmon on their migration. It (and everything at Katmai) is truly a once-in-a-lifetime experience. Also features an Alaskan steam sauna! At the end of your stay our guides will professionally vacuum seal and pack up to 50 pounds of your catch for you to take home and share. Many may be befuddled as to what they will fish at The King Salmon Lodge in King Salmon, Alaska. But that's why we're here! At the beautiful King Salmon Lodge, you'll be fishing for one thing and one thing only: Tuna! Just kidding. Obviously the King Salmon are well known in these parts, but there are plenty of other fish just waiting to be reeled in. With easy access to nearby Katmai National Park PLUS the fact that KSL is perfectly situated on the bank of the Naknek River, there's enough incredible fishing here to go around. Meanwhile, King Salmon offers 18 modern, comfortable rooms with private baths, two suites and seven guest cabins as well as Wi-Fi and professional fishing guides for anyone that wants them! It all adds up to an unforgettable Alaskan experience! King Salmon Lodge is a short scenic 15 minute float plane flight to Katmai National Park, where you can see Alaskan Coastal Brown Bears or the fabulous Valley of 10,000 Smokes. There's a total of five species of salmon, plus trophy rainbows, arctic char, grayling and northern pike! Katmai was originally established as a monument in 1918 to protect the volcanically devastated region surrounding Mount Katmai and the Valley of Ten Thousand Smokes. A trip to Angry Eagle Lodge & Outfitters is a nonverbal way of saying "I'm ready for an unforgettable experience". Once you arrive, you'll understand what we mean! Whether you're in search of tranquility or the fish of legend, you'll find it at Angry Eagle Lodge & Outfitters. Their knowledgeable guides can offer assistance and insight to fly and spinning anglers of all experience levels, while the accommodations are spacious and spotless. After a long day spent fishing, there's nothing quite like kicking your feet up in the lodge and relaxing with a beer and appetizers, all while the onsite chef prepares a gourmet meal of king crab, prime rib, or inch-thick pork chops, just to name a few. And with no one around for miles, count on some of the best sleep you’ll ever get- plus some of the brightest stars this side of the stratosphere! Angry Eagle Lodge accommodates groups of 12 to 14 people per week and includes satellite TV and Wi-Fi. The Lodge was riginally named Rainbow Bay Resort when it was built in 1984.